A new investment of resources aimed at Delta small business owners, entrepreneurs, and communities is designed to grow the region’s economy and create jobs, the Delta Regional Authority and Louisiana Governor Bobby Jindal announced October 16, 2012. Louisiana’s Planning & Development Districts aided local governments and non-profit organizations with successful applications under the Delta Regional Authority’s States’ Economic Development Award Program to advance entrepreneurship, transportation/infrastructure, workforce development and related initiatives. 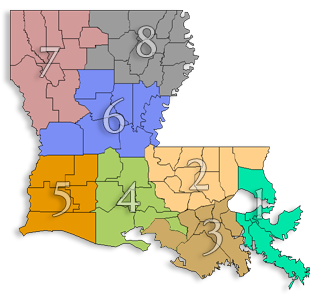 The Districts worked with Doyle Robinson, Alternate (DRA-Louisiana), of the Louisiana Governor’s Office to advocate for these investments throughout Louisiana. Fourteen new investments coming directly to Louisiana, from industrial park developments to programs supporting entrepreneurs and business development, leverage $1.7 million in federal resources into more than $12.5 million in total public and private investment for the Delta region, its people, and its future.